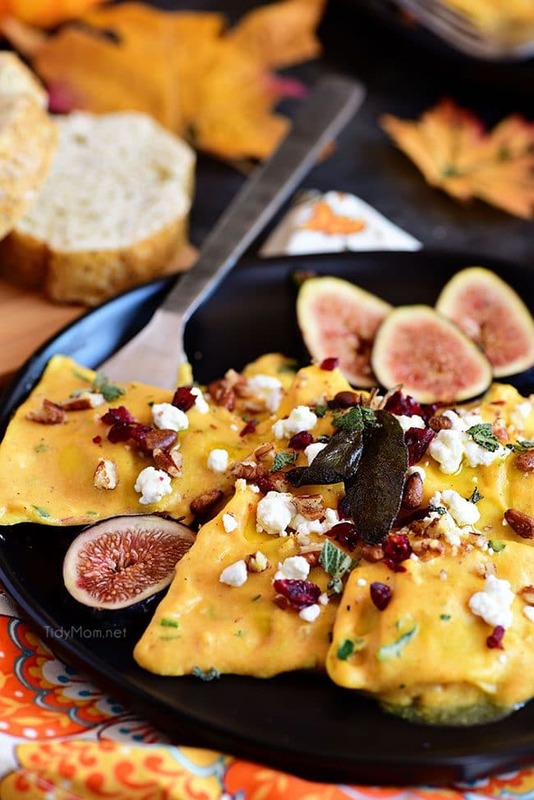 Pumpkin Alfredo with Butternut Squash Ravioli is the epitome of fall flavors in one dish! Topped with goat cheese, dried cranberries, and toasted nuts for a simple dish that tastes just like a gourmet meal. Have it on the table in less than 30 minutes an easy weeknight dinner everyone will enjoy! I’ve partnered with Spectrum® Organics to share how their wide range of cold pressed and expeller pressed products can open doors to culinary adventures in your cooking journey! Don’t miss the end of this post that includes how you can enter to win a trip to Barcelona, Spain. My obsession with this pumpkin alfredo recipe all started when I was having dinner at this little tucked away restaurant outside of Columbia, MO in Rocheport. This place is one of the most quaint restaurants I’ve ever been to and is full of charm. If you’re ever in the area I highly suggest checking it out, because you’ll never experience anything like it anywhere else. Their menu changes all the time and is only written on a big dry erase board. While browsing the options I noticed they had a featured pumpkin alfredo pasta that sounded amazing and I just went for it. Well, let me tell you, as soon as the first bite hit my mouth I was in heaven and I knew I needed to recreate this recipe. 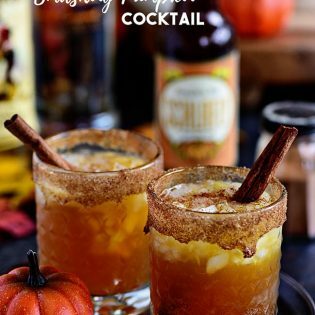 It was the perfect mix of savory and slightly sweet, with just enough cinnamon to get you into the feelings of fall. A Savory Pumpkin Dish, Why?? I was once a firm believer that pumpkin was meant for sweet recipes and sweet recipes only. The idea of savory pumpkin made me cringe just a little. Let me tell you now though, as someone who has moved to the other side. I never knew what I was missing with savory pumpkin dishes, and there is no going back now. 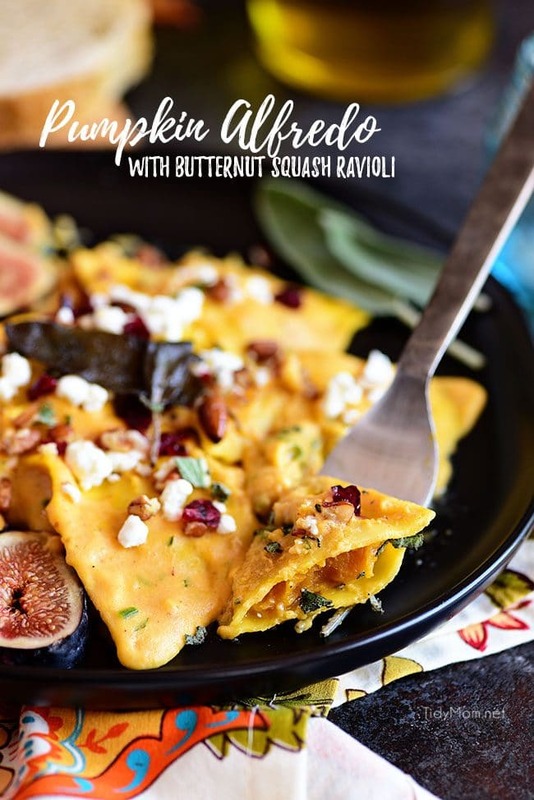 The pumpkin flavor brings all of my favorite cozy fall flavors into a delectable pasta dish, that’s to die for! I knew with recreating a recipe like this, it needed to be perfect, creating a finished dish everyone will crave. We made about 4 different versions of this sauce, with a lot of trial and error before coming up with the final result, and it’s almost identical to what I had at that restaraunt, so if you can’t make it to the middle of Missouri anytime soon, no need to fret, I have the recipe for a little taste of Abigail’s right here! 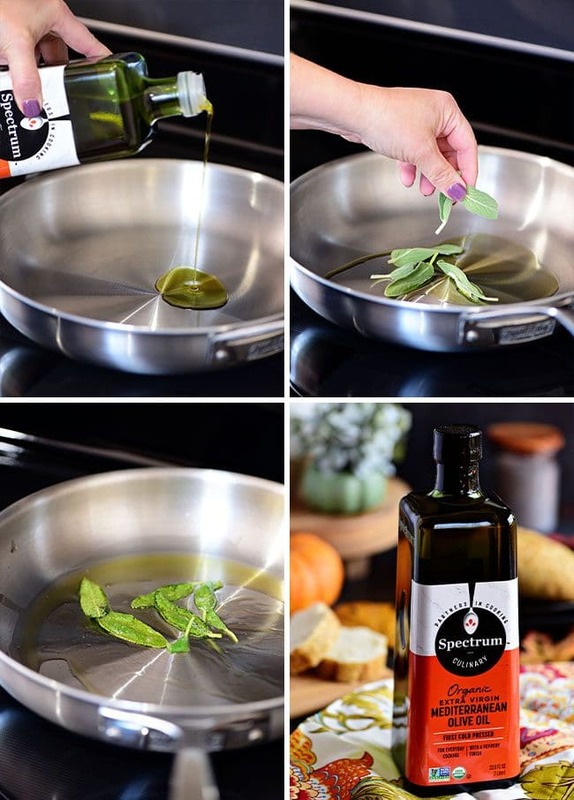 Choose the Right Oil: I love cooking with Spectrum Organic Extra Virgin Mediterranean Olive Oil because not only is it a better for you oil option, but it’s also sourced from hand-selected olives grown along the southern shore of the Mediterranean. The infusion lends a delicate flavor and peppery finish which pairs perfectly with the sage in this dish. Infuse Sauce with Fresh Sage: Heat the Spectrum Organic Extra Virgin Mediterranean Olive Oil in a large pan over medium-high heat. When the olive oil is hot, reduce to medium heat and add fresh sage leaves. Fry just until oil stops bubbling around leaves, 10 to 15 seconds (try not to let them brown), then remove carefully with tongs and set aside to drain paper towels. Add Your Remaining Ingredients: After infusing the sage you can start adding your other ingredients. Place the butter in the pan and melt over medium heat. Then add minced garlic and saute it start to turn yellowish. Once you’ve got things all finished up with the sage, butter, and garlic it’s time to really get into the thick of things. When making a homemade pasta sauce it can be easy to come out with a finished product that’s either way too runny or way too thick. Just follow these few steps to a T and you’ll be smooth sailing all the way to a perfect pumpkin alfredo. Add a little flour and whisk until smooth. Cook over medium-low heat, whisking frequently, for 3–5 minutes, or until bubbly and fragrant. Next, add some half and half and 1 cup of chicken broth. Whisk until combined and add pumpkin, Parmesan, minced parsley, minced sage, nutmeg, and pumpkin pie spice. Simmer uncovered for 10-15 minutes stirring occasionally. Thin sauce with more chicken broth as needed. 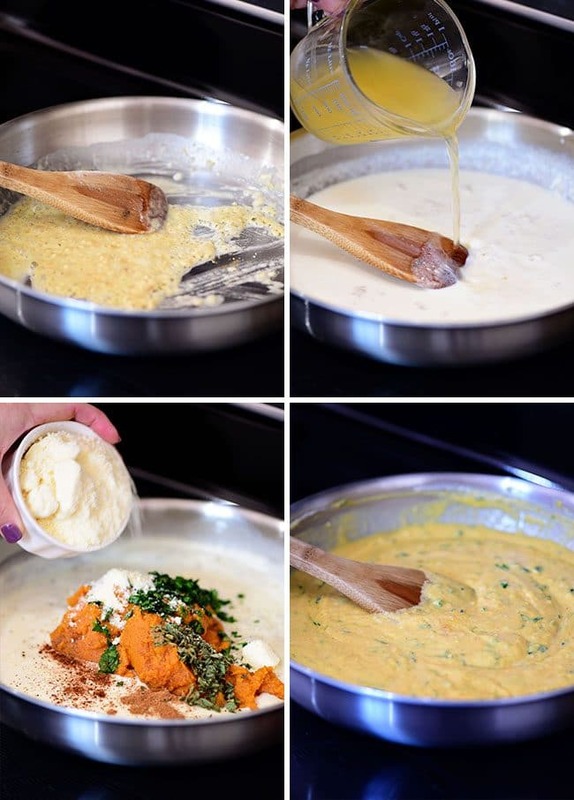 You now have the most delicious pumpkin alfredo sauce!! Boil some refrigerated butternut squash ravioli and gently fold into the sauce. 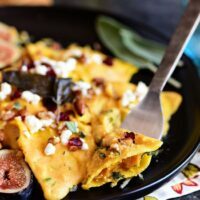 If you can’t find butternut squash ravioli, cheese ravioli would be delicious with pumpkin alfredo sauce. When serving, add toppings and a drizzle of Spectrum Organic Extra Virgin Mediterranean Olive Oil. This is arguably the most important part of the recipe, for me. You wouldn’t think a few extra topping sprinkles would have that much effect, but they do! The tanginess of the cheese, paired with the tart cranberries, and toasty nuts make the perfect combination to really take this recipe to the next level. If you’re thinking about leaving some of these off to save time or think they just sound weird, just give it one try! Worst case scenario you don’t like them and just scrape it off, but I have a feeling you’re going to love the flavors as much as I do! Slow Cooker Beef Tip Sandwiches your perfect weekend or dinner crockpot recipe. I’m confident you’re going to love these Slow Cooker Roast Beef Dip Sandwiches! Serve with a side salad and you’re done! Creamy Chicken Pot Pie is always a winner at our house. Dinner doesn’t get any easier than this, with ready-made pie crust and rotisserie chicken. This homestyle chicken pot pie recipe is super simple and perfect for a weeknight meal. Hearty Chicken Pumpkin Soup This easy pumpkin soup is made with chicken, pumpkin puree, chicken stock, and fresh vegetables Cream and cheese are stirred in at the end for added richness. The perfect fall soup! Southwest Black Bean Stuffed Butternut Squash is a meatless dinner idea that doesn’t leave you hungry. Not only is this meal colorful and delicious, but also full of beans to add protein so even the biggest carnivores won’t miss the meat. 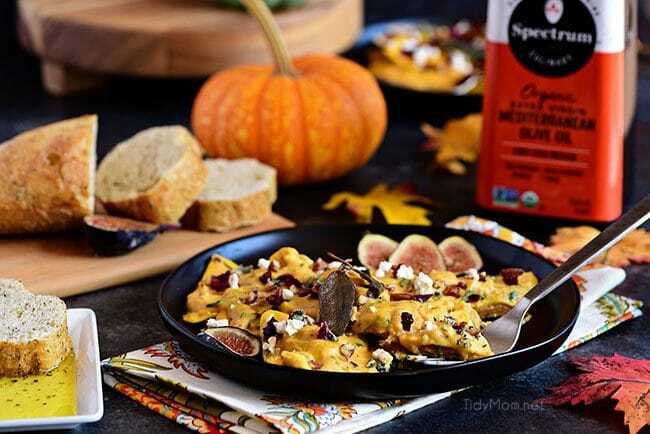 Pumpkin Macaroni and Cheese My favorite way to enjoy pumpkin is in a savory version, like this Pumpkin Macaroni and Cheese. And boy did I enjoy this one. Could not stop eating it!!! LIKE THIS PUMPKIN ALFREDO RECIPE? PIN IT! The Spectrum® brand line of natural and organic culinary oils and vinegars has more than 30 varieties of seed, nut and plant oils that are good for any type of cooking, including coconut oil, olive oil, canola oil, avocado oil, grapeseed oil, sesame oil and more. They travel the globe to source from the best regions to develop products that will enhance the flavors of your dishes while also supporting a better-for-you lifestyle. Now you have the chance to experience the vibrant city of Barcelona, Spain and taste the best of Catalan cuisine. WIN: 2 Grand Prizes: 8 day/ 7 night trip to Barcelona, Spain for winner and 1 guest during May, 2019. Trip includes coach class airfare 6 nights hotel accommodations, ground transportation in Spain, activities, breakfast daily, four lunches and four dinners and US $400 spending money. Heat oil in a large pan over medium-high heat. When oil is hot, reduce to medium heat and add sage leaves. Fry just until oil stops bubbling around leaves, 10 to 15 seconds (try not to let them brown), then remove carefully with tongs and set aside to drain paper towels. Add butter to the pan and melt over medium heat. Then add garlic and saute it start to turn yellowish. Add flour and whisk until smooth. Cook over medium-low heat, whisking frequently, for 3–5 minutes, or until bubbly and fragrant. Next, add half and half and 1 cup of chicken broth. Whisk until combined and add pumpkin, Parmesan, minced parsley, minced sage, nutmeg, and pumpkin pie spice. Simmer uncovered for 10-15 minutes stirring occasionally. Use the remaining cup of chicken broth to thin sauce as needed (I ended up using all of the remaining cup, by adding a little at a time). While sauce is simmering cook ravioli according to package directions. Drain ravioli and gently stir into sauce. Plate and top each serving with a drizzle of olive oil, crumbled goat cheese, dried cranberries, and nuts. Enjoy! This post is in partnership with Spectrum® Organics All views, opinions, and love of good food are all my own. Thanks to the brands, and readers, who help support TidyMom. Love frying sage in olive oil- so delicious! Ironically, I’ll be in Barcelona in June of next year, but hopefully someone else will win that fun trip! Frying sage is one of my all time favorite things – the smell is unreal! This looks like the ultimate comfort food for fall! And hello….. BARCELONA???? So my dream to visit someday!!! Okay this looks amazing!! Thanks for sharing! Absolutely mouthwatering and oh those flavors! Oh my gosh, this look so insanely delicious. Thank you for sharing. I love pumpkin everything, and that butternut squash filling. To. Die. For. Gorgeous. 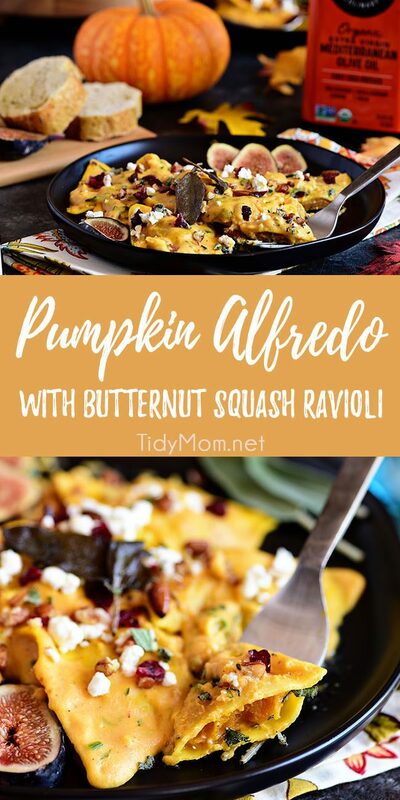 I love pumpkin in a savory dish…why should the sweets have all the fun?! This looks delicious and I can’t wait to try it. 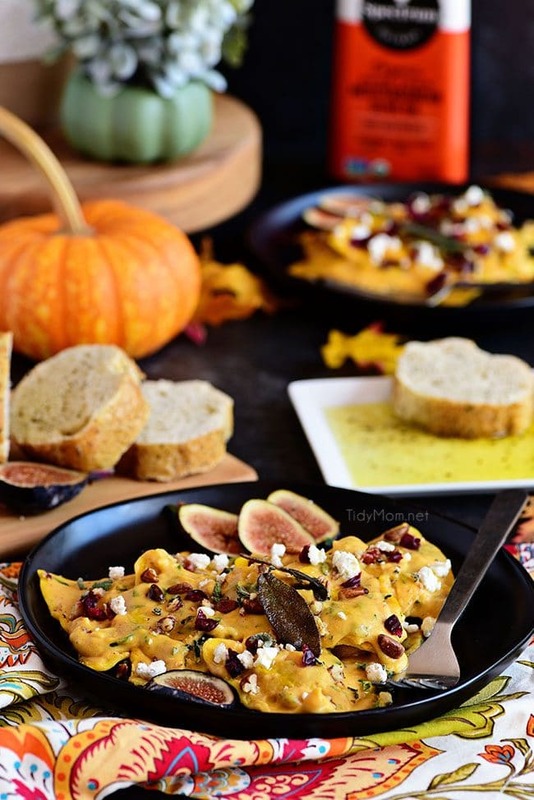 I love pumpkin in a savory dish…why should the sweets have all the fun?! This looks delicious and I’m sure my family will love it! 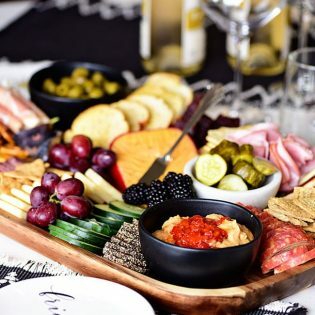 This is the perfect fall dinner! Such amazing flavors all in one dish! This recipe is absolutely perfect for the fall season! Looks heavenly! So tasty and delightful recipe, craving for this right now! I love all things pumpkin! This pasta alfredo will be perfect for dinner tonight. What a yummy idea! This screams fall!